Costs less than Reliable Barracuda 2000u33 Taiwan but it is a copy from China and does not include the extension table, carry handle, bottom cover, welt and zipper feet and it is not individually tested for quality control assurance at the factory (as is the Reliable Barracuda 2000U-33). Semi Industrial Sewing Machine with Upholstery capability. 800 SPM with attached motor included. Walking foot dual-feed capability built-in. Upholsters furniture, tarps, tents, custains, cushions, quilts, dresses and much more. Great portability with handle accessory on top. The cases shown below as recommended accessories are a close fit because of the machine's motor. The case might bulge slightly, but it will close and snap shut. 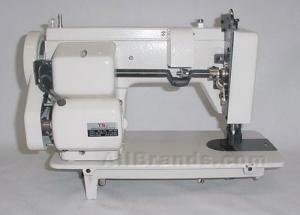 Industrial Sewing Machine with Upholstery capability. 800 stitches per minute with attached motor included. Sews Heavy leather up to 3/8" thick, covers, sails. Upholsters furniture, tarps, tents, curtains, cushions, quilts, dresses and much more. Maximum zigzag stitch width: 0.2". Adjustable stitch regulator and tension. Cleated prostration belts combine with new geared hand wheel pulley, geared reduction pulley and geared motor pulley to eliminate slipping. High lift walking foot with 3/8" clearance underneath the foot. Special heavy duty motor attached up to 150 watts, 1.5 amps, twice as much as home sewing machines. Spring loaded reverse. Uses 16 class welt foot. 4 stitches per inch maximum stitch length. Power: 6600 RPM, 150 watts, 1.5 amp motor. Included accessories box, bobbins, needles, oiler, and screwdrivers. Will this machine handle a size 92 thread and 20 needle? Also, I see that you do not accept returns - do you test the machines before shipping? 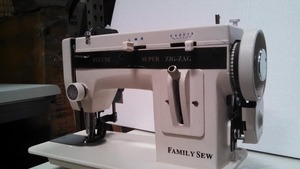 James, Family Sew FS288ZZ below will take up to size 25 needles 135x17 regular or 135x16 leather. As long as the thread size does not take up more than 1/2 the space of the needle eye, it will sew fabrics up to canvas, denim and upholstery. We do not open the factory sealed cartons or they would not be new. 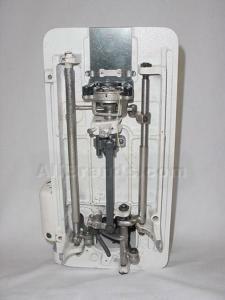 We do service free under the 90 day industrial warranty if any defects are found in material or workmanship. After 90 days you could take to a local sewing machine mechanic for any paid repair work. Let me know if you have any questions. Hope this information helps. What is your application, materials used, and accessory needs? . Phone support from KIM was of the highestate order. When she could not answer my guestrooms about the Reliable wheel,, she provided their contact information. The "fit and finish" of this machine areally almost amateurish.That said, the price was right AND, it seems able to sew anything. I am very pleased with it. We bought this machine for sails, it goes through our several layers of cloth canvas with ease and also does multiple layers of marine Sunbrella. All metal parts inside so no plastic junk to wear out. Just like any good sewing machine, oil it with sewing machine oil before each use and it will last forever. It's a strong machine and the powered walking foot makes sewing heavy layers a lot easier and faster. Was VERY happy with this purchase and the speed of delivery! Definitely will do business again!